Rancho Xotolar is a working ranch that has been in the Morin Ruiz family for over four generations. We are located in the high plateau 18 kilometers from the center of San Miguel de Allende in a rural and pristine environment untouched by modernization. Our land is situated adjoining the newly opened archaeological site of Cañada de la Virgen, a pre-Columbian construction of pyramids and other architectural structures of the central basin of the Laja river that is attributed to tolteca-chichimecas groups of central Mexico. 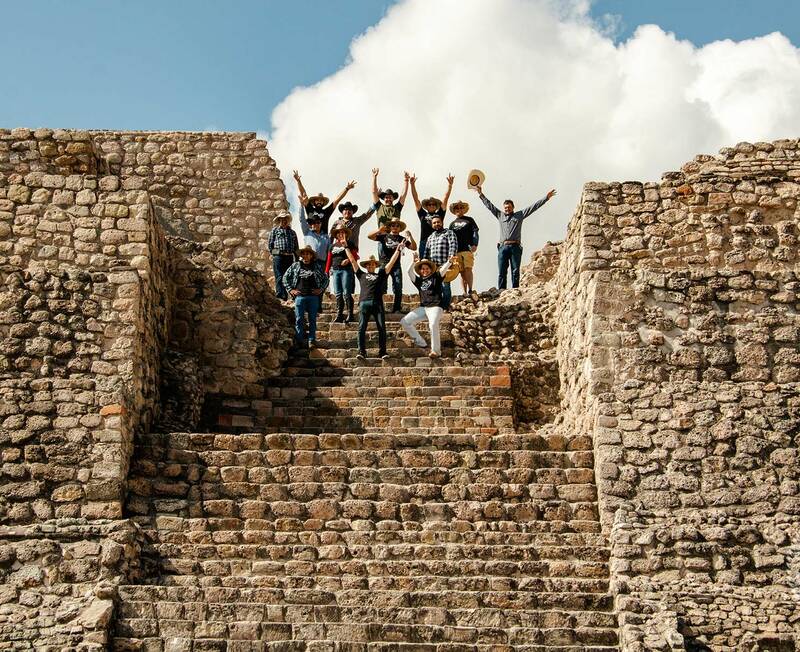 Here our guests can experience the true cultural life that is Mexico, today and yesterday. You will enjoy the wide open spaces, not like a tourist, but as a member of the Morín Family. You will ride through spectacular countryside with breathtaking views and stunning landscapes guided by Thomás and Felix Morín who will share their vast knowledge and skills while keeping your safety in mind. After your ride, enjoy an authentic ranch “comida” (luncheon) of delicious, freshly prepared specialties of Rancho Xotolar along with a cold “cerveza” (beer). We are not a commercial tour company, but family owned and operated. We offer a variety of beautiful scenic rides in the mountains outside of San Miguel de Allende. We provide an authentic ranch style comida/meal in our family’s home. Make your visit to San Miguel de Allende truly memorable! Rancho Xotolar can accommodate groups large or small and will tailor any ride to fit your needs and desires. 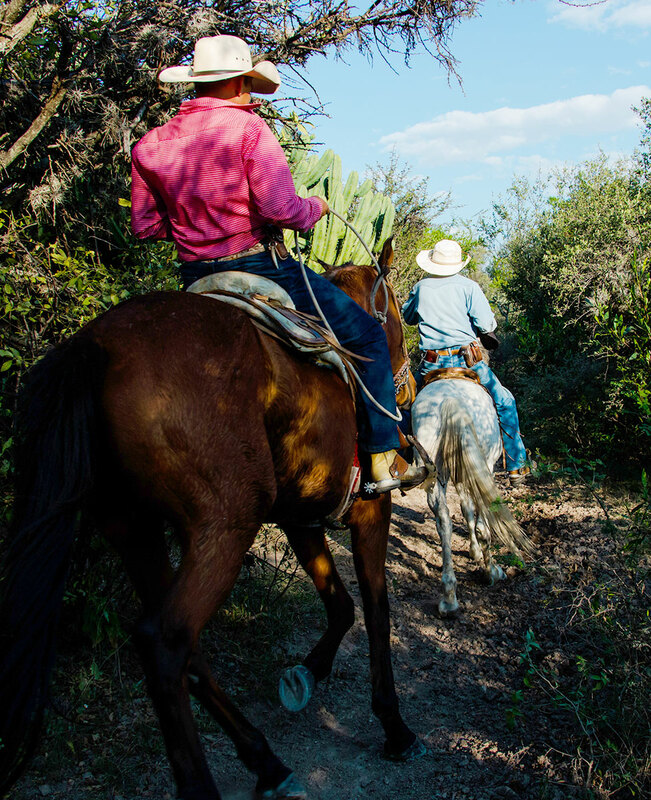 The Moríns are experienced ranchers and horsemen who have been working this land for over 50 years. Your safety and well-being are of utmost importance. See our RANCH ACTIVITIES listing for tours and rates or call or e-mail. Besides fabulous riding environment and free lunch. Live a unique experience together with us at Rancho Xotolar. We are waiting for you! What a wonderful day for two truly novice horseback riders! We did the 2 hour ride that was absolutely beautiful with Felix and his riders expertly guiding us. Their horses were well trained thus allowing us to enjoy the ride and scenery. The lunch prepared by Felix' sister was a perfect ending to the entire authentic experience. Last Sunday I spent a wonderful day riding with my friends Chema (SMAride.com) and Cindy from the Rio Laja Dam to the Xotolar Ranch. The ride was about 6 hours long. Felix and Roberto guided us through an old railroad tunnel, small villages and beautiful scenery. Along the way we stopped at one of Pancho Villa’s places, a huge sacred tree and an old church were animals were blessed. At the old church they prepared lunch on an open fire with all the food from the Ranch. For me it was an experience I will always remember. I have to admit at the end of the day I was really tired (but a good tired). I have ridden at the Xotolar Ranch several times before on shorter rides. Thanks Felix and Roberto! One of the highlights of my trip to San Miguel. The staff at the ranch are great and it felt like visiting a Mexican family....they made us feel right at home. The horseback ride was awesome and the real cowboys from the ranch and the real gentle horses took good care of us. Spectacular scenery, wonderful Mexican family, and great horseback ride made for a memorable day. We did a sunset horseback riding tour with Tomas and his family. We were 4 adults and a 12 year old who have minimal horseback riding experience. Very quickly we were reassured to trust the horses and to let them do their job. Even though the terrain seemed treacherous the horses were surefooted. The ratio of tourists to guides was 2 to 1 so we never felt that our horses could run out of control. The scenery was beautiful and we enjoyed a cold beer at the half way point of the trip. Tomas and his brother Feliz are very capable horsemen and photographers! At the end of the ride we were treated to a delicious dinner and more cold beer. A definite highlight of our trip to SMA! !